Ubud, Bali, once a mostly serene “hippie” destination for travelers interested in yoga, healthy food, and fresh air, has grown into one of the busiest and most popular destinations in Bali. Elizabeth Gilbert’s book Eat, Pray, Love — and the 2010 film of the same name — permanently pushed Ubud to the forefront of the tourist radar. But despite the popularity, green rice terraces still cling to the edges of town, defiant against impending development. Vegetarian eateries and hipster cafes serving excellent coffee abound. Boutique shops showcase Bali’s famous craftsmanship and work from local astists. Hindu architecture and peaceful temples compensate for increased consumerism with an air of ancient authority. You’ll want a few days to get the most from a visit to Ubud, but these tips will expedite the process of getting to know Bali’s cultural epicenter. Bali's coasts are great for sand and sunsets, but Ubud is arguably the cultural, artistic, and holistic heart of Bali. You could spend weeks taking advantage of the many health-improving options before starting on all the sights and activities. 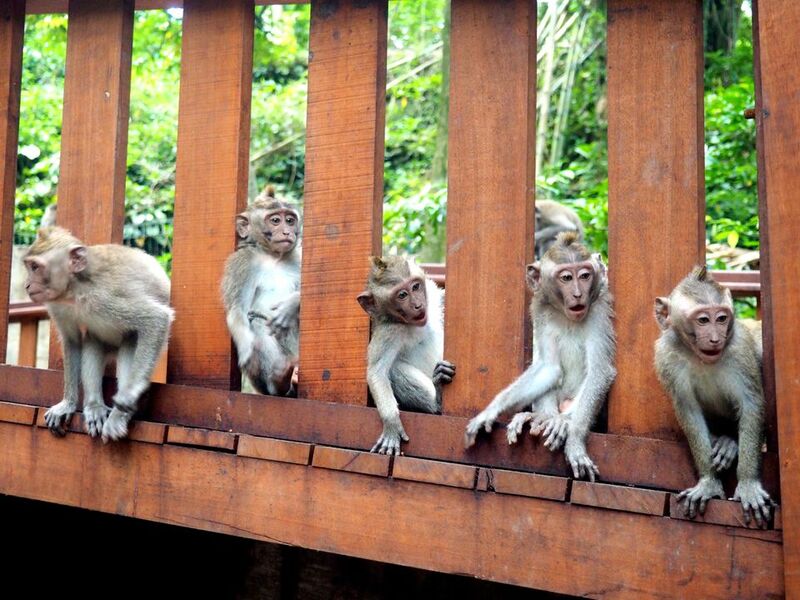 For first-timers, the premier of all things to do in Ubud is to visit — and possibly get robbed in — the Monkey Forest. The green sanctuary occupies the southwest corner of Ubud, but the resident macaques roam freely, sometimes bullying passerby and making raids on nearby shops. Opportunities for up-close photos abound, just watch out for your camera! Along with visiting the Monkey Forest, seeing a traditional Balinese dance performance is almost compulsory. Yes, the shows are touristy; regardless, they're entertaining and memorable. The nightly shows are easy to find and feature talented performers in colorful costumes. Ubud's central location makes it the perfect base for visiting nearby attractions. The green cascades of the Tegalalang rice terraces are just a 25-minute drive north. Goa Ganjah, the Elephant Cave temple, is only 15 minutes to the east. If the Tegalalang terraces are too busy, they often are, continue 20 more minutes to the lesser-known Pura Gunung Kawi for a very unique experience at the 11th-century temples. The Betel Nut on Jalan Raya Ubud to the west of town center is a beautiful venue that often hosts cultural events. Check their schedule for documentary screenings, poetry readings, and special events. Despite the tranquil reputation of Ubud, simply walking around town is often frustrating. You can quickly lose that Zen mindset minutes after leaving yoga class. Jammed traffic — vehicles and pedestrians — and severely broken sidewalks require a bit of energy to navigate. You may find yourself wishing you had packed combat boots rather than flip-flops. The sidewalks around Ubud are notoriously uneven and damaged; broken drainage holes with jagged metal bars pose hazards that injure travelers every year. Drivers often congregate on sidewalks to offer transportation. Sidewalk vendors and shop displays take up the rest of the space. The twice-daily Hindu offerings in small baskets (canang) collect in front of businesses and have to be stepped around. Before stepping off the sidewalk to avoid an obstacle, cast a quick glance over your shoulder to ensure that an impatient motorbike driver isn’t zipping along the curb in your direction. People often drive the wrong way on Ubud's one-way streets. Ubud is blessed with an abundance of good eateries, vegetarian cafes, juice shops, and European-style restaurants. You won’t have any trouble finding healthy food, although menus are a little pricey compared to the rest of Indonesia. For a cheap, authentic Indonesian meal, consider eating in the local warungs or find a Padang rumah makan (eating house). You can enjoy a plate of rice, piece of fish or chicken, vegetables, boiled egg, and fried tempeh for around 25,000 rupiah (US $2) or less! Look for eateries with food displayed in the window; simply point at what you want to put on your plate of rice. Padang Food: Warung Masakan Minang Halal is a simple-but-excellent Padang eatery on the north end of Jalan Hanoman (left side when facing Jalan Raya Ubud, the main road). Traditional Roast Pig: To sample babi guling (roast pig) prepared deliciously the Balinese way, get to Warung Ibu Oka. The simple restaurant was made famous by the late Anthony Bourdain. It's only open four hours a day; pigs are stuffed with herbs and roasted off site. Don't expect to eat anything else there other than babi guling and the sides that accompany! Balinese Food: For a healthy, very affordable meal of local tempeh and nasi campur (mixed vegetables on rice), check out Warung Biah Biah on Jalan Goutama. If it's too busy, which it often is, try any of the nearby eateries on the same street — competition is fierce. Vegan Food: For the healthiest vegan options and medicinal teas in town, Seeds of Life (also on Jalan Goutama) is the most unique of Ubud's many places to eat healing food. Western Food: The Italian-run Buonasera just down the street from Seeds of Life serves the best brick-oven pizza in town with a glass of red wine. Unlike Gili Trawangan in nearby Lombok's Gili Islands, Ubud isn’t exactly a “party” place. Regardless, you’ll find a handful of fun options for socializing. Restaurants throughout town advertise evening happy hours with a set list of cocktails on offer. Bands and guitarists entertain at some places in early evenings during happy hour. After dinner, things get a little more interesting, particularly at the string of bars around the soccer field located at the north end (closest to Jalan Raya Ubud) of Jalan Monkey Forest, at the intersection with Jalan Dewista. CP Lounge is a large, popular, late-night place with hookah pipes, live entertainment, pool tables, open-air hangouts, and an enclosed dance floor with DJ. Prices for drinks are about what you would expect at home. For a more sophisticated setting, check out Cafe du Monyet for wine and cocktails in a comfy atmosphere. Tip: Watch out for arak, a locally produced spirit often the primary alcohol found in happy hour drinks because it's so cheap. Call it Indonesia's "moonshine." Sadly, methanol poison from drinking arak is responsible for the deaths of locals and tourists each year. Haggle, negotiate, and haggle some more! Ubud is overflowing with boutique shops and galleries, however, asking prices start several times the value of the actual item. Don’t stress: negotiating prices is a part of the culture and can be a fun interaction when done correctly. Arrive early; merchants are sometimes more inclined to meet your price if it’s the first sale of the day. Shop around; you’ll often find the same items for less deeper inside the market. Negotiate hard but always give a little on the final price to help vendors save face. Buy as many of your souvenirs as possible in the same place for more bargaining leverage. Tip: In Indonesia, you can begin a transaction by asking bisa kurang? (sounds like: bee-sah koo-rong) or “Can discount?” Sometimes you'll receive a smile and small discount right at the start! Unlike in other parts of Southeast Asia, minimarts along Jalan Monkey Forest don't have consistent pricing. A Coke or bottle of water in "tourist" minimarts may cost as much as three times more than regular price at a shop literally two doors down. If yoga is going to be a big part of your visit to Ubud, ask up front about booking a package or bundle of lessons rather than paying each time. You'll often receive a discount for committing to several classes; sometimes accommodation is discounted with yoga bundles at places such as Yoga Barn. Many homestays and guesthouses in Ubud offer free breakfast — choose a place that does and take advantage! A large community of artists and craftsmen call Ubud home. Numerous galleries are situated around town. On the fringes of Ubud, hand-carved goods are literally piled outside of workshops; many will offer you discounts (and shipping) on sizable works. The Ubud Art Market, at the corner of Jalan Ubud Raya and Jalan Monkey Forest, is an outdoor art clearinghouse. It opens early (6 a.m). Get there in the morning and be prepared to negotiate for inexpensive gifts, souvenirs, and handmade goods. But don't believe for a minute that every wooden object on display was made by an artist in Bali; much of it is imported from elsewhere in Asia. Ubud is also home to many talented metalsmiths and jewelers. If you own a stone and have considered commissioning someone to create a custom piece of jewelery, Ubud is a good place to do so. Yoga is ubiquitous in Ubud. Whether you're a pro or just curious, there are endless opportunities for taking advantage of cheap sessions in beautiful settings. A single yoga class is usually US $10 or less; it gets even cheaper if you purchase a pass or bundle of several classes. The Yoga Barn on Jalan Raya Pengosekan is by far the largest and most popular place for travelers to try yoga, but there are many other options. For an alternative, check out Radiantly Alive in town, or for intimate classes in a stunning setting, inquire at Taksu Yoga on Jalan Goutama. ATMs on the usual bank networks are found throughout Ubud. Using an ATM attached to a bank branch is always the safest as there is less chance that a card-skimming device has been installed. Also, ATMs that are physically near their bank sometimes offer higher daily limits and a better chance of getting your card back in the event it is captured. ATMs often display the currency denominations available. Whenever possible, use machines that dispense 50,000-rupiah banknotes: they are easier to break than the 100,000-rupiah notes. Paying for a cheap coffee with a 100,000-rupiah note is bad form; vendors may have to run for change. Offers will come in abundance from private drivers as you walk around Ubud. If you need one, rather than accepting offers on the street, ask at your reception. They'll inevitably have a family member willing to drive you, and there will be a lot more accountability. Negotiate a rate and details before setting out. The ridesharing app Grab is popular on Bali; it's convenient for getting around by car. Because of trouble from the local taxi mafia, your driver may act "low key" or want to collect you somewhere other than at the main entrance of the hotel. Much of Ubud’s charm lurks in the green countryside just outside of town. In 15 minutes or less, you can be watching white herons pick through verdant rice terraces. Many good homestays and retreats are located just outside of walking range. Only travelers experienced with the ins and outs of driving in Asia should consider renting motorbikes. Traffic in Ubud becomes chaotic. Don’t accept offers from people offering to rent you their personal motorbikes — these sometimes result in expensive scams. Instead, ask at your accommodation for a more legitimate rental. Take photos of the motorbike, and point out any existing damage or scratches to the owner so that you won’t be held responsible later. Although many travelers drive without one, you’re supposed to have an international driver’s license to drive in Indonesia. The local police are renowned for stopping travelers on the outskirts of town. Locals posing as police officers also try to stop tourists (you'll know they're fake because they drive regular scooters adorned with police stickers). If stopped, you’ll be asked to pay a “fine” on the spot — often all the money you have in your pocket. Keep money in two separate places in case you are stopped, and always wear a helmet. You’ll find rural scenery, rice terraces, and small craftsmen villages along the three roads that head north from Ubud. Driving north toward the Kintamani region of Bali is eventually rewarded with great views of Mount Batur — a big volcano — and its adjacent lake. You’ll be expected to pay 30,000 rupiah to enter the Kintamani region. Dip into one of the hot springs in the area to relax a bit before driving back. Stop off at one of the many orchards along the way to buy fresh oranges and other fruit for the cheapest prices on the island. Tip: To save money and get better engine performance, fuel up at proper petrol stations rather than buying bottles of gasoline from vendors on the side of the road. The famous Monkey Forest in the southwest corner of town is unsurprisingly filled with...you guessed it: monkeys. But the mischievous macaques don’t stay within the confines of the forest — they are free to roam and often hang around Jalan Monkey Forest just outside the reserve. The monkeys are well trained at efficiently robbing tourists, and you’ll definitely be targeted if you walk past the forest with food. Even a water bottle may attract attention, and there's a very good chance you'll be outnumbered. Snacks (even unopened) in a purse or backpack are quickly detected by the vigilant monkeys that then team up within seconds to investigate. Don’t play tug-of-war with a monkey that grabs onto something; if bitten, you'll have to go for a series of rabies shots! You’ll need proper dress (covered knees and shoulders) to enter the monkey forest because of the Hindu temples located inside. Be careful with phones, cameras, backpacks, sunglasses, and other belongings inside — the monkeys are curious and regularly climb on tourists. If a monkey climbs on you, just be cool — and remember to smile for the funny photo someone is sure to grab. You’ll find a handful of interesting Hindu temples dotted around Ubud, although they may be closed for prayer times and special days on the Hindu calendar. Don’t wear shorts if you plan to explore the temples. Men and women are expected to cover themselves with a sarong; some temples provide them for free at the entrance while others will rent you one for a small fee. Always remove your shoes before entering a religious place. Unfortunately, bemos — Indonesia's dirt-cheap, shared transportation option — have largely disappeared from the island. Tourists are pushed to using private taxis for moving between destinations in Bali. Check for buses at the Perama station on the left side of Jalan Hanoman after it splits away from Jalan Monkey Forest and becomes Jalan Raya Pengosekan Ubud. Look for a simple, green sign with covered bus stand and ticketing counter. Perama buses are an inexpensive option for reaching other popular places on the island. Grab, a ridesharing app in Southeast Asia similar to Uber and Lyft, allows you to pay drivers in cash rather than through the app. Travelers often visit the same places in Bali and may be going your direction. Ask around to see if anyone is interested in sharing a private taxi to split costs and cut down on traffic. The airport serves as somewhat of a hub for public buses. If you absolutely can't get a ride somewhere, you can always get back to the airport then go onward from there.